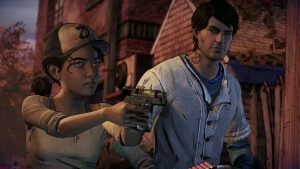 A New Frontier is the third installment in the Telltale series of The Walking Dead. This premiere was a little different than other Telltales games, premiering with two episodes and I’ll be covering both in this review. The opening offers an amazing backstory to our lead character Javier, showing what he went through at the beginning of the apocalypse; showing him being beaten for missing the death of a family member. The exposition this sets up plays amazingly into the character of Javier and the story definitely benefits from it. One big improvement I immediately noticed was the game play. There’s more interaction when shooting or dodging people, and it adds to the presentation greatly. Of course we have to talk about performance. I played the game on the PS4. The frame rate can be choppy sometimes, but it’s not a twitchy game where every frame matters. I can’t tell whether the game is targeting 60 frames per second or just leaving it unlocked, as it rarely runs at 60fps. Don’t let this deter you from the excellent narrative the game tells. Clementine does return and it’s amazing to see her growth over the first two games in the series. You can tell how much she has taken after Lee whether it be her actions or just the way she stands with her arms crossed just the way Lee did. The story is so far great and well told, as expected from Telltale. I found myself engrossed with the characters not even 15 minutes in the game. So do I recommend you pick up the premiere to The Walking Dead: A New Frontier? Absolutely.